The cat was nicknamed Macavity after the mystery cat in T.S Elliot's poem. He gets on the bus in front of a row of 1950s semi-detached houses and jumps off at a row of shops down the road which include a fish and chip shop. Driver Bill Khunkhun, 49, who first saw the cat jumping from the bus in January, said: "It is really odd, the first time I saw the cat jumping off the bus with a group of passengers. I hadn't seen it get on which was a bit confusing. "The next day I pulled up on Churchill Road to let a couple of passengers on. As soon as I opened the doors the cat ran towards the bus, jumped on and ran under one of the seats, I don't think any of the passengers noticed. "Because I had seen it jump off the day before I carried on driving and sure enough when I stopped just down the road he jumped off - I don't know why he would catch the bus but he seems to like it. I told some of the other drivers on this route and they have seen him too." Since January, when the cat first caught the bus he has done it two or three times a week and always gets on and off at the same stops. 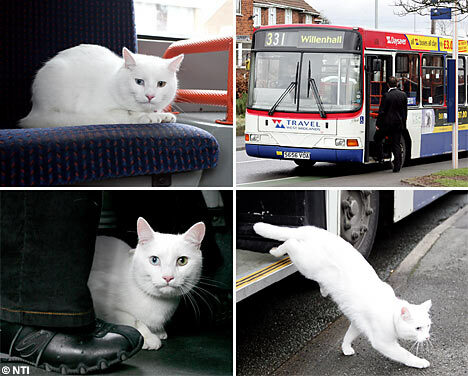 Passenger, Paul Brennan, 19, who catches the 331 to work, said: "I first noticed the cat a few weeks ago. At first I thought it had been accompanied by its owner but after the first stop it became quite clear he was on his own. "He sat at the front of the bus, waited patiently for the next stop and then got off. It was was quite strange at first but now it just seems normal. I suppose he is the perfect passenger really - he sits quietly, minds his own business and then gets off."